FRIDAY, Apr. 19 BASEBALL: Southern Wells at Anderson Prep, 5:30 p.m.; North Side at Norwell, 5:30 p.m.
TUESDAY, Apr. 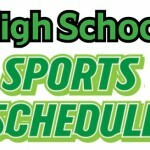 16 BASEBALL: Jay County at Norwell, 5 p.m.; Southwood at Southern Wells, 5 p.m.
MONDAY, Apr. 15 BASEBALL: Southern Wells at South Adams, 5 p.m.; Norwell at Snider, 5:30 p.m.